I like to think of Singapore as a revolving door. It's constantly moving at a steady pace within it's "door frame" of values. New business opportunities and ideas easily take their place in the rotation and just as rapidly, the stale ideas and failed business ventures go out. It's a constantly moving marketplace. To maintain its foundation is the mixture of Asian and Western values which I think of as the door frame. These are what keep the nation in harmony. They anchor this revolving door and keep it from falling off it's hinges. For example: New restaurants come in (i.e. Chili's) and the failed attempts go out (i.e. Taco Bell). This is also the same for shops, companies, hair products and even Boston Baked Beans. Yes. I was deeply upset about the sudden lack of my BBB's. It's amazing to me just how fast and how often this little island reinvents itself. It's like it never sits still. I'm constantly being rerouted around construction sites around the entire country and I don't even recognize the area between the mainland and Sentosa anymore. It's changed dramatically in just the year and a half that I've lived here. 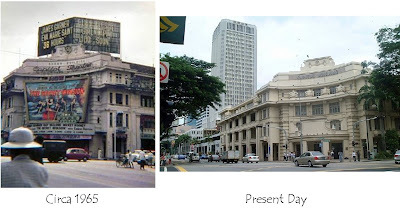 So when the gals at work sent me emails with pictures of the "old" Singapore. I was beyond intrigued. This place has changed so much more than I even thought. It doesn't even look like the same Asian city. I've shared a few of these treasures with you below. Next to each one, I've attached the modern day equivalent. Some of the differences are so astounding that you can't even recognize it as the same space. *Some of the buildings I've shown you have been placed on the historical registry (or the Singaporean equivalent) and are kept in their natural state. That's why a few aren't that different. In all though, it's amazing to me just how much Singapore has evolved in the mere 44 years that it's been an independent country. It went from jungle to metropolis in an astounding amount of time. Most countries take hundreds of years to build themselves into what Singapore has become in just decades. The pictures you posted brought back memories, especially the one of the beach. Yes, we had "real" beaches back then. I fondly remember when I was growing up weekends spent at the beaches here. Now most of them are "fake" i.e. reclaimed land and definitely not as nice. I miss that. Sandra, I was also going to say that Sembawang Beach looked nicer before, when it had beach sand, though I don't have fond memories of it. The biggest shocker to me are the photos of Orchard Road. They look nothing alike, at all. Give Singapore another 30 years and it will be beyond what most 1st world nations have I bet. Well, unless the economic problems don't even out soon anyway. Also Singapore wasn't so crowded back then. It's the crowds that annoy me now. You can't even walk into most restaurants here on weekends because of the long queues. My daughter who is in Australia loves the life and "space" there and does not want to come back. Good and bad everywhere I guess but for her more plus points overseas.